Through struggles, come important life lessons. Years ago, I was fortunate to ride a lovely young gelding who followed all of the rules. He was very smart and rather talented. Anywhere he lacked in movement or talent, he more than made up for the deficiency in heart and effort. We competed successfully in the Prix St. Georges in the fall of his six-year-old year. In June of his seventh year, we cantered down the centerline to compete successfully in our first Intermediate 1 test. Everything just fell into place and soon after that, piaffe, passage and one tempi changes were part of our daily practice. That horse became my gold standard for the training timelines of all the horses I rode after him. While I was still riding and showing dressage on the easy gelding, I bought a Dutch Warmblood foal named Zamboni. I had been riding other people’s horses for a long time, but Zamboni was the first horse I ever owned. I purchased him when he was a month old and envisioned his training schedule just like I experienced with the gelding. In my mind, there was no reason to think otherwise. Zamboni had good, uphill conformation, good bloodlines, and a really good canter. All of the necessary ingredients for a successful dressage horse were there, or so I thought. Fairly early in Zamboni’s life, it became evident that he marched to the beat of his own drummer. As a foal, he dragged me into the pine trees regularly, made the farrier bleed more than once, and always leaped away from the vet. Every event was a new adventure, even when it was something that had been a good experience. A small amount of doubt began to creep into my mind. I would still believe though, that his antics would fade as his age increased and we would be on our way to the FEI arena in the blink of an eye. At 4-years-old, he was goofy and distracted under saddle but had an amazing talent for flying changes. His response to a loss of balance was to do a clean change. I added an aid when he changed on his own and soon he was a baby genius who did clean flying changes on cue. Therefore, I thought my training plan was ahead of schedule. I was sure the spooky, distracted goofball would turn into a workaholic when he turned five and we would be on the way to Prix St Georges a year later. His 5-year-old year came and went, then his sixth year passed. He was schooling tempi changes and pirouettes on good days. On other days, we could barely make a 20m circle without spooking, leaping or sliding into a sudden halt. We weren’t on the training timeline anymore. The more I compared him to other horses his age and my gold standard gelding, the less I enjoyed riding him. Early in his seventh year, he sustained an injury and it was six months before Zamboni was in full work again. We lost half a year of training. My goal of following the training timeline went out the window. I watched other trainers succeed with their young horses following the path set by USEF, similar to the schedule set by the gelding years earlier. There are tests for 4-year-olds to 6-year-old horses. Then, there is a division for 7 to 9-year-olds competing at Prix St Georges and 8 to 10-year-olds at Grand Prix. The standards in these tests are high, but achievable, for talented horses and trainers. My 7-year-old horse was able to do everything in the Prix St. Georges but never all on the same day. His mind just couldn’t stay focused long enough to get through a test. Attempts to show him at lower levels were lackluster due to his inability to focus. His eighth year was sidelined by another injury and an illness. I was feeling dismal and began to believe the people around me who doubted Zamboni’s worth. I never stopped loving my horse or ever considered for a minute that I should sell him, but I didn’t enjoy the rides anymore. To me, Zamboni represented my failure as a trainer, regardless of the success I was having with my client’s dressage horses. From the outside of a situation, it’s easy to give advice to others. I regularly consult with clients who find themselves stuck in a training rut. 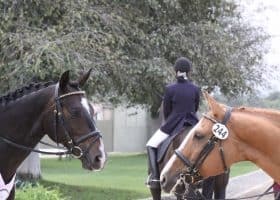 Many times, I’ve told people that when riding becomes drudgery or they no longer look forward to riding their horse, it’s time to make a change. They should either change the training, change the goals, or sometimes if it’s really not going to work, change the horse they are riding. I knew what I would tell someone else if they owned Zamboni. I’d tell them that he’s different than the other horses, that he would need patience and time. A lot of time. And, just maybe, I would tell someone else that he might not be the right horse for the goal of becoming an FEI competition horse. Each horse is an individual. Some seem to take forever to mature while others speed through the levels like a rocket ship. It’s easy to look at the horses competing in the young horse classes and feel like your horse must be inferior because he isn’t as developed as the ones at the championships. What we don’t see in the magazines and on websites, is that every trainer showcasing a young, talented horse also has a couple at home that just aren’t quite ready or that don’t quite fit into the standard training mold. There will always be horses that seem, like some people, to be born to succeed. Others will have to work a little longer. I’ve known horses that really struggled through the lower levels. Although, once the basics were finally confirmed, we were back training at the same upper level with their peers in no time. On the other hand, some horses never really learn to handle the competition environment comfortably. The age of social media has given us a window into the worlds of equestrians everywhere. We watch horse show classes online. 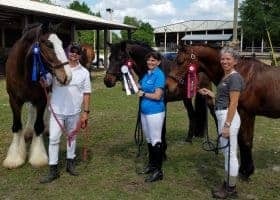 Additionally, there are daily updates of blue ribbons and training achievements from everyone including our friends to celebrity trainers. Social media presents an idealistic picture of highlighting the good stuff. Does anyone ever update their status with a blurb about how after six months of training their mare still can’t do a clean flying change? Or that their 8-year-old gelding still spooks at the same flower box he’s been stopping to admire since he was a baby? These things happen to everyone but not many people are going to showcase it publically. At some point, I think it’s important to remember why we started riding horses in the first place. Of course, our goals are always changing, but there was something that drew us here. For me, it was the horses themselves. I loved the smell of them, their power, their beauty, and their character. The best part was how they were generous enough to let me sit upon their backs and share all of those things with me through the saddle. In the beginning, I never even thought about competition, other than maybe it would be a fun thing to do one day if I were ever lucky enough to own a horse. I remember in my first riding lesson, sitting atop a big gelding and burying my fingers in his thick palomino winter coat, thinking there was no better place I could ever be seated than on top of a horse. Zamboni is nearing his eleventh year. In the past few months, I have begun to enjoy my horse again. I think of a teenage version of myself and wonder what she would have thought about the prospect of owning a 17.1 hand, dapple gray, Dutch Warmblood gelding. That girl would have been awestruck by Zamboni with his big arched neck and deep brown eyes. She wouldn’t care about training timelines or his show record. She would, however, be thrilled that Zamboni loves flying changes and can do a few steps of piaffe and passage. My 13-year-old self could never have possibly dreamed of owning such a magnificent creature. Zamboni is still a goofball. I’m not sure we’ll ever show in the FEI arena together. Most importantly, I’m okay with that now. I have other talented horses to ride and they have taken that pressure off Zamboni. My heart swells with joy though, when Zamboni morphs into a schoolmaster. He and my husband, Brian, can ride a good shoulder-in together on a sunny Saturday afternoon. They are just out there having fun, enjoying the ride. Somewhere along my journey with Zamboni, I had forgotten to enjoy the ride.